New Century Careers was proud to host the MSC/Pittsburgh Chapter NTMA Apprenticeship Competition again this year! Click here to read the full article in the Pittsburgh Business Times. Rich Payo was hired as job shop manager and Mike Mills was promoted to facilities manager/training supervisor. After just six months in operation, New Century Job Shop at New Century Careers’ (NCC) Training and Innovation Center is proud to announce the hiring and promotion of two individuals focused on meeting custom parts production for customers while delivering world-class training to NCC’s pre-apprenticeship training program, MANUFACTURING 2000 (M2K). NCC Director of Services Neil Ashbaugh spoke with Jordan Conigliaro on “Issues on the Point” about training at New Century Careers. Watch the full interview to learn more about NCC’s tuition-free MANUFACTURING 2000 (M2K) Machinist Training Program and career opportunities in the region. Do you want to get rid of an old vehicle but don’t want to deal with selling it, fixing it, or junking it? Consider donating your used vehicle to New Century Careers. The donation process is safe and simple and will help support NCC’s programming. To find out more about donating your unwanted vehicle, click here. New Century Careers plans to add the MANUFACTURING 2000 (M2K) machinist training program to Eastern Westmoreland Career and Technology Center (EWCTC). The program is expected to begin in February 2019. For those interested in training, please call 1-800-822-9337. Support New Century Careers – 2018 Holiday Coasters for Sale! Give the gift of a custom, limited edition, holiday coaster manufactured by a trainee of New Century Careers’ New Century Job Shop. Individual coasters are $6.99, or 4 coasters for $25.00 (plus tax and shipping). Enjoy the holidays while supporting the training and job placement efforts of individuals beginning their manufacturing careers! To place your order, please contact Matt Zema at 412-258-6624. Checks: Payable to New Century Careers and should be mailed to 305 East Carson Street, Pittsburgh, PA 15219. To ensure delivery by December 25, all orders and payments must be received by December 14. Don’t delay and miss out on giving this great gift! Save the date – Giving Tuesday! On Tuesday, November 27, 2018, please consider donating to New Century Careers. Your contribution will help NCC serve more students, who will gain valuable job skills and be prepared for in-demand positions in the Pittsburgh region. Donations can be made here or by mail. New Century Careers is grateful for your contribution! Many thanks to Lynne Hayes-Freeland KDKA for having New Century Careers on the show! Watch the full segment on career job training below. 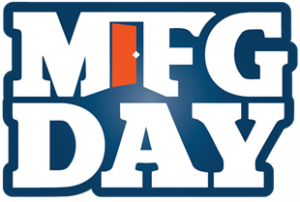 Join the Manufacturing Day Movement! In celebration of Manufacturing Day 2018, New Century Careers will open its doors on Wednesday, October 3 to show the outstanding opportunities in advanced manufacturing! Two sessions (1:00-3:30PM and 3:30-4:30PM) will be available at NCC’s Training Innovation Center, located at 305 East Carson Street in Pittsburgh’s South Side. Please note: there is limited street parking at NCC’s Training Innovation Center. Paid parking is offered at Station Square. See demonstrations on today’s high-tech, precision machines- including newly acquired TRAK CNC milling machines- in a clean, climate controlled environment. Collaborate with New Century Job Shop trainees and instructors who can help solve your need for small batch runs or prototypes, while creating revenue to supplement the NCC cost of providing training. Bring your plans for a brief consultation! Meet M2K instructors and trainees to learn first-hand how FREE training can lead to a manufacturing career with hundreds of local openings. Also, learn about SWPA BotsIQ, a manufacturing workforce development program disguised as a high school robotics competition. PITTSBURGH (August 15, 2018) – The Pittsburgh Chapter of the National Tooling and Machining Association (NTMA) is now enrolling apprentices for the 2018-2019 program year. The final registration deadline is August 17, 2018 and classes begin in September. The Pittsburgh Chapter NTMA provides regional manufacturers with a proven apprenticeship training program for individuals seeking metalworking educational opportunities. This 4-year apprenticeship program delivers related instruction classes to support on-the-job training provided by employers. “This is a fantastic opportunity for individuals and companies to support the formal education of machinists in the region. With each successful skill learned, a person has an opportunity to advance to higher levels of responsibilities and wages.” said Neil Ashbaugh, NTMA Pittsburgh Chapter Program Administrator. Trainees can choose from three training site locations, including Central Westmoreland CTC, Northern Westmoreland CTC and New Century Careers Training Innovation Center. During the 2017-2018 program year, the Pittsburgh Chapter NTMA had 140 apprentices and 59 companies participating. The Pittsburgh Chapter will be accepting new apprentices and companies up until the registration deadline. For additional information or to register your employee(s), please contact Matt Zema, NTMA Apprenticeship Program Coordinator at 412-258-6624, via email at zema@ncsquared.com, or visit www.pghntma.com. About the Pittsburgh Chapter National Tooling and Machining Association: The Pittsburgh Chapter of the National Tooling and Machining Association (NTMA) is made up of companies, both large and small, that believe in the future of manufacturing for southwestern Pennsylvania and assume a leadership position in the training and development of future generations for the metalworking profession. About New Century Careers : New Century Careers (NCC) contributes to the economic health of southwestern Pennsylvania through meeting manufacturing workforce needs by working to deliver a capable workforce to employers of the region. NCC seeks to improve the lives of individuals through the development of skills that lead to good quality family wage jobs and careers. For more information, visit www.ncsquared.com. NCC’s Director of Services Neil Ashbaugh spoke with Larry and John this morning on the KDKA Radio Morning News. NCC’s MANUFACTURING 2000 (M2K) program offers tuition-free training and job placement assistance. Take advantage of this great opportunity to begin a career in advanced manufacturing. Paul Anselmo, President/CEO of New Century Careers, was featured in today’s Letter to the Editor in the Pittsburgh Post-Gazette. Click here to read his Letter to the Editor. “They did their best to instill a hard work ethic and the value of sort of pursuing your own path.” Afshan Khan, NCC Board member, learned versatility from her parents. Click here to read the Pittsburgh Post-Gazette article. New Century Careers launches Job Shop aimed at helping trainees get jobs while supporting small manufacturers. New Century Careers is seeking a full-time Manufacturing Manager to join the team! Interested candidates, please forward resumes to Tanika Harris at harris@ncsquared.com. Designed by local industry partners, New Century Job Shop is a unique way to locally outsource manufactured components. The Job Shop will assist manufacturers by providing parts from prototype to small batch production runs, all while creating revenue to supplement the cost of training more skilled workers for precision machining jobs in Southwestern Pennsylvania. Get started today! Contact Neil Ashbaugh at 412-212-0828 or ashbaugh@ncsquared.com to learn more. Neil Ashbaugh, NCC’s Director of Services, discussed exciting career opportunities and training in manufacturing on the podcast, Going Deep with Aaron Watson. The need for a highly skilled workforce formed the foundation of New Century Careers and the MANUFACTURING 2000 (M2K) program, which provides students with tuition-free machinist training as well as job placement assistance. Click the link below to listen to the full podcast! 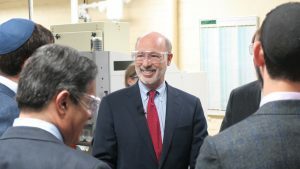 Governor Tom Wolf visited New Century Careers on March 9 to discuss his PAsmart workforce development initiative, tour NCC’s Training Innovation Center and spend quality time with students. Mayor Bill Peduto, Allegheny County Executive Rich Fitzgerald, and PA Dept. of Community & Economic Development Secretary Dennis Davin were also in attendance. – Encourage employers to partner with colleges and universities. During the event, New Century Careers also hosted an open house and group tours prior to the governor’s announcement. Attendees included representatives from multiple manufacturing partners, members of the NCC board of directors and foundation leaders who are all committed to the continued success of NCC’s vital work. 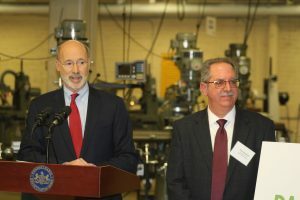 Click here to read more about Governor Wolf’s visit and PAsmart initiative. New Century Careers invites you to explore the world of manufacturing. NCC’s Training Innovation Center, located in Pittsburgh’s South Side, will open its doors on Monday, May 21 from 11 a.m. – 1 p.m. for a tour in conjunction with Remake Learning Days. Students, parents, educators and community members are invited to see a showcase of programs through a guided tour and participate in a hands-on matching & measuring activity. This open house will expose modern manufacturing to students, parents, educators and community members. It will feature programs such as MANUFACTURING 2000 (M2K), Southwestern Pennsylvania (SWPA) BotsIQ and the National Tooling and Machining Association Apprenticeship Program. In celebration of Manufacturing Day 2016, New Century Careers (NCC) will open its doors on Wednesday, October 5 to show students, educators, parents and community members the outstanding opportunities in advanced manufacturing! Two sessions (10AM-2PM and 5PM-8PM) will be available at NCC’s Training Innovation Center, located in Pittsburgh’s South Side. If your party is interested in attending both sessions, please contact Katie Delverne at delverne@ncsquared.com. Activities include interactive tours with demonstrations showing visitors pathways to successful manufacturing careers and the educational programs and training that New Century Careers provides. To register, please visit http://www.mfgday.com/events/2016/new-century-careers-4. Join New Century Careers & SWPA BotsIQ for an Open House! As a part of the Remake Learning days, we will be showing parents, students, teachers and community members what the new manufacturing is all about! New Century Careers has an Amazon Smile account! When you shop using our account, a portion of your sales will go toward our mission of providing FREE machinist training! A lot can happen when you Start With A Smile! High school students & parents, mark your calendars! New Century Careers and SWPA BotsIQ are holding an open house on May 11! Explore the new manufacturing and see what types of job opportunities & education are available! The NIMS Career Pathway Tool helps employers, job seekers and educators understand the numerous career pathways in the industry and what NIMS credentials really mean—how they help validate skills at a variety of levels and how they can be earned to help students and workers enter and advance in careers. The goal is to help employers enhance HR practices; help educators design better curriculum; and provide actionable career information to job seekers. In 1997, regional manufacturers in southwestern Pennsylvania identified a critical shortage of entry-level machinists and other manufacturing workers. 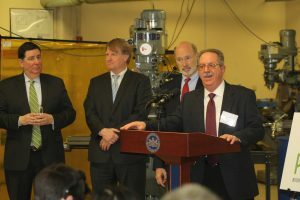 A group consisting of representatives from Steel Center Area Vocational-Technical School, the Institute for Economic Transformation at Duquesne University and executives representing 17 manufacturers partnered to create MANUFACTURING 2000 (M2K). The M2K entry-level machining program, administered by the non-profit organization, New Century Careers (NCC), is a pre-employment/pre-apprenticeship program that recruits unemployed, underemployed, and low-income individuals in southwestern Pennsylvania. It provides hands-on machining training in collaboration with industry in addition to instruction in technical math, machine theory, blueprint reading and metrology. Skills are verified through National Institute for Metal Working Skills standards and credentials. M2K was cited as an exemplary regional partnership in Vice President Biden’s report “Ready to Work: Job-Driven Training and American Opportunity.” The program emphasizes active career coaching by program staff. This approach enables participants, who often face multiple barriers, to progress along a career pathway to meaningful occupations in the manufacturing industry. There are more than three million open skilled positions and twice as many disconnected young adults neither working nor in school. In Next Generation Career Pathways: A Manufacturing Case Study, we assert that new market demands are shaping next generation career and technical education opportunities. The rise of anywhere, anytime learning and competency-based approaches provides the opportunity for Career and Technical Education programs to lead the way in terms of applying blended, competency-based education in practical ways. Apprenticeships and Their Potential in the U.S. The modern concept of apprenticeships is a “learn and earn” strategy with “work-based learning.” In the U.S., these programs may be categorized as registered apprenticeships (RAs) regulated by the U.S. Department of Labor (DOL), non-RAs, and youth apprenticeships. This article focuses on RAs, including the expansion of RAs to new industry sectors and disadvantaged populations. Check out Chapter 28 on page 195 “Local Industry Takes Responsibility for Workforce Development Efforts” written by our President Paul Anselmo! Paul writes about how the Pittsburgh Chapter NTMA partners with New Century Careers, a non-profit, to develop workers for the metalworking industry! 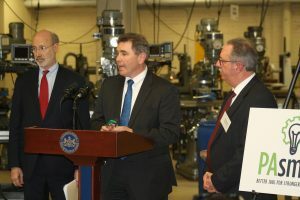 In the Pittsburgh region, General Electric is building a $32 million additive manufacturing facility in Findlay Township, and Alcoa is undertaking a $60 million expansion of its research and development center in Upper Burrell to accelerate the development of advanced 3D-printing materials and processes. After years of decline, the United States manufacturing industry is enjoying an upswing. The sector has added 600,000 jobs since 2010. Manufacturers are optimistic that they are gaining momentum, and according to a 2015 report from Deloitte and the Manufacturing Institute, the nation will have 3.5 million manufacturing jobs to fill over the next decade. Manufacturing Day 2015 is approaching! Pittsburgh has numerous events for MFG DAY, check out local events around you! Registration Begins for the 2015-2016 NTMA Apprenticeship School Year! Registration is now open for the 2014-2015 Pittsburgh Chapter NTMA’s apprentice training. We are pleased to provide the Related Instruction portion for Pennsylvania’s apprenticeship program. Each year, we accept approximately 75 new apprentices into the four-year training program. Do you know someone who would be a good fit? Check out our website for the application forms and process. In the next 15 years, the Allegheny Conference on Community Development estimates the region will need to fill 144,000 jobs left vacant by workers 45- to 65-years-old who are aging out of the workforce. The advanced manufacturing sector, with one of the oldest workforces in the region, will have to fill tens of thousands of jobs in that time. Alex Telford thought he’d go to a traditional four-year college after graduating from Highlands High School in June, probably to major in engineering. But his plans changed when he got a chance to see modern manufacturing processes up close through one of a number of STEM programs — short for science, technology, engineering and math — taking root nationally to meet a critical shortage of workers in these disciplines. “A common criticism of the Unretirement movement (people earning an income during the traditional retirement years) is that it’s a fine idea for office workers and white-collar professionals. But blue-collar workers? Hardly. Did you know that there is a World Skills competition?! Montez King, director of credentialing for the National Institute for Metalworking Skills (NIMS), was appointed as a volunteer Expert for the Manufacturing Team Challenge students competing at the 43rd WorldSkills Competition, in São Paulo, Brazil. BotsIQ: Teams of students are paired with local companies that teach them how to design and build 15-pound robots that can survive battles with robots built by competing teams. In addition to math, computer-aided design and other technical skills, the students learn budgeting, time management, and how to make an affordable robot that works. Career Tech joins a network of social programs connected through Jail Collaborative, an interdepartmental initiative that aims to reduce recidivism and prepare inmates for life on the outside. Amy McNicholas Kroll, administrator of the jail’s re-entry services, said the goal is to return productive people to society and help them make a living wage. Early-career machinists, for example, are in high demand and can make $11 to $14 per hour. Manufacturers are increasingly looking to high schools and community colleges to fill current staffing needs and gear up for a wave of Baby Boomer retirements. Educators are trying to dispel student’s misconceptions about the industry and spark their interest before they choose other jobs or head to four-year colleges, a costly career investment that has yielded disappointing results for some graduates. Manufacturers across the United States are targeting schools and colleges to let young people know there is more to manufacturing than pulling levers on an assembly line. “People still have the idea that manufacturing is a dirty dungeon place,” said Andy Bushmaker of KI Furniture, a maker of school desks and cafeteria tables in Green Bay, Wisconsin. The goal, Bushmaker said, is to get people to see manufacturing jobs as the high-tech, high-skilled and high-paying careers they can be in the second decade of the 21st century. Check out Millennial’s thoughts on American Manufacturing. “For a generation of young people who live in Greater Pittsburgh today, tales of factory smokestacks and heavy industry dominating the landscape seem like folklore from a bygone era. Stay connected with New Century Careers! Read NCC’s e-newsletters for upcoming class information, events and more.